A chimpanzee (not pictured) managed to escape its enclosure after building a makeshift ladder from a tree branch. Concerns have been raised about safety at Belfast Zoo after two animals were able to escape from their enclosures. In January, an endangered red panda went missing overnight but was later found safe and well in a nearby garden. 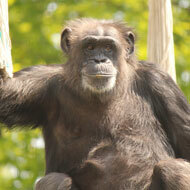 Then on Saturday (12 February), a chimpanzee managed to escape after building a makeshift ladder from a tree branch. Speaking to BBC News about the chimpanzee incident, Clare Bailey, Green Party leader for Northern Ireland, said: "I've seen videos of the escape and it shows it was cool, calm and well executed. "We need to really start looking at what's going on at Belfast Zoo. I would be keen to meet up with the zoo (managers) and have these conversations." Alliance North Belfast Councillor Nuala McAllister said that she had contacted Zoo owner Belfast City Council to ask for an urgent review into the containment of animals, with a particular focus on safety measures. "The council has a duty of care around the welfare of animals at the zoo but we also need to ensure the safety at all times of the public,” she said. Belfast City Council said in a statement that the incident was “highly unusual”. A spokesperson added: "We would like to reassure the public that Belfast Zoo is fully committed to providing a safe and enjoyable experience for all our visitors. "Zoo management is assessing whether the tree branch used in the escape fell after morning checks had been completed."